Spill-safe keyboard, plus it´s warrantied for life. This sleek keyboard features a spill-safe design that protects electronics from liquid damage. Slim profile design saves valuable workspace, while PS2/USB compatibility allows use with both older and newer computers. For PCs running Microsoft® Windows® 98 or later. Black 101-key keyboard. Lifetime warranty and free technical support. 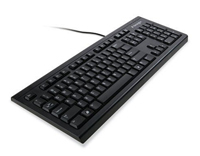 The K64370A model incorporates some minor upgrades and differences versus the original 64370 Keyboard for Life, including slightly lower keys for a smoother key-stroke action.